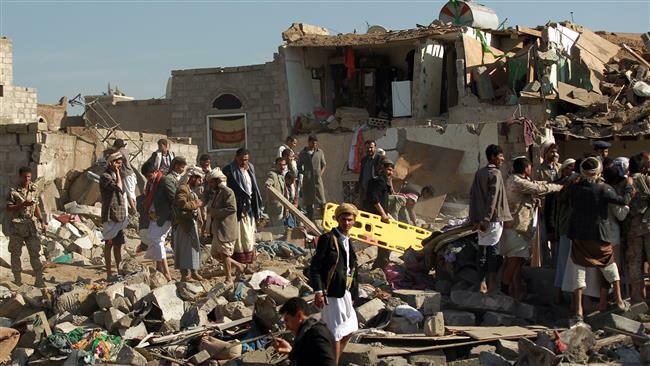 JNN 30 Mar 2015 Sanaa : Warplanes of Saudi-led Arab coalition forces raided Yemen’s capital of Sanaa on Sunday, as the airstrikes against the Shiite Houthi group enters the fifth day. Warplanes hit the camps of reserve forces loyal to former President Ali Abdullash Saleh in southern Sanaa and the air defense base in the Red Sea city of al-Hodayda. There are about 200 killed and more than 500 Injured in the Saudi Led Aggression on Yemeni Population , in order to Crush the Legitimate Public Revolution led By Shia Houthis Media reports. The airstrike hit several military targets in Sanaa and a reserve forces base in the central Dhamar province overnight Friday, which killed at least five soldiers in the capital, a security official told Xinhua. Local media reported that dozens of soldiers were killed last night as the airstrikes hit the largest military base in the capital. However, the Houthi group refused to reveal the death toll. Yemeni President Abd Rabbou Mansour Hadi urged on Saturday the Arab states to continue their military operation against the Shiite Houthi group until it is fully defeated. Speaking at the 26th Arab League summit in Egypt’s red sea resort city of Sharm El-Sheikh, Hadi urged the coalition forces, which have been pounding the Houthi group, to go on with their airstrikes until the rebels’ surrender and defeat. Saudi Arabia and fellow Gulf Cooperation Council member states launched airstrikes on Houthi positions in Yemen on Thursday, a move condemned by Iran but supported by the United States, Egypt, Jordan, Morocco and GCC countries . On the same day, Saudi Arabia’s King Salman bin Abdulaziz Al-Saud said the Saudi-led military airstrikes against the Houthis in Yemen will continue until security is restored in the country, at the Arab summit. “The Decisive Storm Operation will continue until the Yemeni people enjoy security and stability,” the Saudi king told the Arab Summit presided by Egypt’s President Abdel-Fattah al-Sisi and attended by 20 Arab monarchs and presidents. In the country’s southern port city of Aden, which is Hadi’s last stronghold before he Ran off to Saudi Arabia on Thursday, pro-Hadi tribal militia have been fighting against the Houthi fighters for about three weeks. The city has been simmering with tensions and armed confrontations for over three weeks with various chaos and looting acts that targeted government institutions. Dozens were killed and more others wounded in a series of blasts at an arms depot in Aden on Saturday when people attempted to loot weapons, a government official told Xinhua. While there are reports that Yemeni Shia Houthi forces have downed a fighter jet in the Bani Ziad region north of Yemen’s capital city of Sana’a, the al-Masirah satellite television station says. The satellite network, which is affiliated to Yemen’s Ansarullah movement, did not provide further details on the incident. An American defense official has announced that the US military rescued two Saudi Arabian pilots over the Gulf of Aden after their fighter jet crashed during combat operations in Yemen. The unnamed official said on Friday that the pilots ejected from their F-15 jet and were rescued by a HH-60 helicopter in international waters. The USS Sterett, a destroyer operating in the region, participated in the operation. The USS New York was also involved. The White House said Saudi King Salman thanked President Barack Obama for the rescue operation. Earlier on Friday, the US president offered Washington’s support for the airstrikes. US National Security Council spokeswoman Bernadette Meehan said Obama reaffirmed the strong friendship between the United States and Saudi Arabia and emphasized the United States’ support for the action taken by Saudi Arabia. “The president underscored our commitment to Saudi Arabia’s security,” she said in a statement. “The president and King Salman agreed that our collective goal is to achieve lasting stability in Yemen through a negotiated political solution facilitated by the United Nations,” she added. Secretary of State John Kerry said on Thursday that his country praises the military action and is backing it through intelligence sharing, targeting assistance and logistical support. Meanwhile, three security personnel of a military hospital were killed during a Saudi airstrike south of Sana’a, a medical source said early on Saturday. On Friday, a Yemeni woman was killed and several other civilians were injured during an airstrike by Saudi warplanes in the Manaba district of the Yemeni northwestern city of Sa’ada. Saudi airstrikes against the impoverished Arab country have drawn condemnation from many countries, including Iran, Iraq and Russia, as well as the Lebanese resistance movement, Hezbollah. This entry was posted in Middle East and tagged Air Strikes, President Ali Abdullash Saleh, Saudi Arabia, Saudi Coalition, Saudi Led Aggression, us, Yemen, Yemeni President Abd Rabbou Mansour Hadi. Bookmark the permalink. THE MOST BEFITTING REPLY ONCE THE YHAHOODI – WAHABI TAKFIRIS HAVE INITIATED THE STRIKES, WILL BE TO KILL ATLEAST 2000 INFIDAL WAHABI CRIMINALS .ALLAH SUPPORTS THE OPPRESSED , LET MAULA HELP TO FINISH THESE WAHABI CRIMINALS TO THE LAST MAN . Reblogged this on Fatimaalkhansa فاطما.